When you convert a refrigerator or freezer into a home brew beer dispenser using Kegco's Deluxe Homebrew Two Keg Kegerator Conversion Kit, you'll have all of the high quality commercial-grade beer components and detailed instructions you need right in front of you. 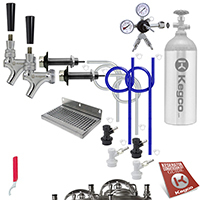 Kegco has thought of everything with this kit, from the commercial grade double gauge regulator for safe and user-friendly CO2 management to the stainless steel drip tray that catches drips and spills for easy clean-up. You can even order this kit with your choice of ball lock or pin locks keg couplers, so you'll have the home brew beer dispense system that's just right for you. This kit has been designed to dispense up to two home brew beer kegs at a time, depending on your refrigerator's capacity. Comments: Quality components, easy to install. I was up and serving in short order. Comments: This kit contained everything needed to make my old refrigerator into a draft beer dispenser extraordinaire. It was put together in a few hours and pouring perfect pints. Comments: I received delivery in just 5 business days, everything was in there (except the manual, which I downloaded from the internet). Comments: Very happy, the regulator could be nicer, but for the price I am happy and have beer on-tap. Comments: just started making beer, bought my equipment here, this stuff is great. Comments: Bought this for Keezer conversion with collar. Got everything I expected. Still waiting on batch to fill kegs but everything appears to be in working order. Comments: Already got two refurbished kegs so this is exactly what I needed. No more. No less. I was skeptical of the plastic hose clamps, but they seem to work just fine. Very pleased with the kit. Absolutely no issues and Beverage Factory was the least expensive everywhere I looked. Notice I didn't say cheapest, but least expensive. These are quality parts, not cheap junk.